Reminiscent of idyllic town Mayberry, Coronado Island is a famous resort town and offers retirement perfection with it's nearly perfect white sand and flat walkable grid like streets. Included below are homes for sale in Coronado. If you would like more information on any of these Coronado real estate listings, just click the "Request More Information" button when viewing the details of that property. We can provide you with disclosures, past sales history, dates and prices of homes recently sold nearby, and more. And, if you haven't already, be sure to register for a free account so that you can receive email alerts whenever new Coronado houses come on the market. Coronado is primarily a resort community. This incorporated town was established in 1890, after the Coronado Beach Company completed a schoolhouse, several recreational clubs, and the Hotel del Coronado. The Hotel del Coronado, a building that is also referred to as The Del or Hotel Del, was one of the first establishments that put Coronado on the path to becoming the premier vacation destination that it is today. Hotel del Coronado is the 2nd largest structure in the United States that is made entirely out of wood. (The largest being the Tillamook Air Museum in Oregon.) It is also one of the only remaining buildings that was built in the style of the wooden Victorian beach resort. This architectural style was extremely popular in the late 1800s and early 1900s, but the majority of these wooden resorts fell into disrepair and have been torn down since then. Hotel del Coronado, on the other hand, is surprising well preserved. Because of this, it was added to the list of National Historic Landmarks and California Historical Landmarks in the 1970s. The resort island of Coronado is not actually an island. Instead, it is connected to the mainland by a tombolo. This thin sliver of land, called the Silver Strand, makes Coronado a prime example of a “tied island.” Coronado and the Silver Strand wrap around to form the San Diego Bay, with Coronado lying directly across the water from Downtown San Diego. Prior to 1944, a shallow strip of water that was known as the Spanish Blight separated Coronado from the North Island. When the United States Navy came in before World War II, they developed the area on and around North Island, including a project that filled in the Spanish Blight and made the area one continuous land mass. Coronado was named after the Spanish word that translates to “crowned one,” earning it a nickname of The Crown City. This city has also shared a name with three local naval ships, the most famous of which was the USS Coronado. The weather in Coronado is almost always warm and sunny, making it an ideal place to engage in dozens of outdoor recreational activities. This community is very bike and pedestrian friendly, with many children and adults choosing to bike or walk to school or work. This area has a very low crime rate, so you will not have to worry about your children biking to school on their own. The local schools include a list of public schools, overseen by the Coronado Unified School District, and two private schools. Everything is located close together on the island, so no matter where you choose to live, you will be just a short distance from the beaches, schools, shops, and restaurants. This area is also known for its artistic and recreational opportunities, so Coronado’s residents are able to enjoy a variety of hobbies without ever leaving the island. Coronado’s 25,000 residents come from a variety of backgrounds. Many of them have relocated to Coronado from foreign countries or other states. Coronado also has a sizable population of retirees looking for a sunny spot to relax. The majority of Coronado’s residents are employed on the island, and the area’s largest industry is tourism. 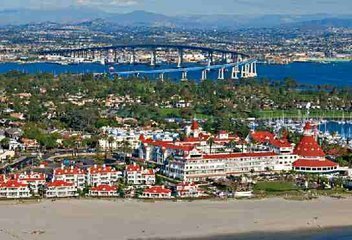 In addition to the Hotel del Coronado, the island is home to two newer resorts: the Coronado Island Marriott and the Loews Coronado Bay Resort, in addition to several other smaller hotels and inns. Once you are on the island, you can enjoy the downtown district’s shops, restaurants, and theaters. Most of the top spots are located on Orange Avenue, including several famous restaurants that serve a variety of exquisite dishes. When searching Coronado Village homes for sale you will find The Coronado Village is one of the most idyllic resort communities in all of California. Anchored by the famous Hotel Del Coronado, the Coronado Village has fantastic upscale shopping and dining opportunities at the hotel, Ferry Landing, Downtown District, and El Cordova. The real estate in Coronado is appreciating at a rate that is consistent with inflation. At present, the median home value in Coronado, CA is just over $1.5 million. However, the homes in this area are much more expensive on a per square foot basis than that of the San Diego Metro area as a whole. The properties on Coronado Island sell for around $950 per square foot, a figure that is nearly three times that of the San Diego Metro average.